Adidas Is Sorry for Congratulating People on Surviving the Boston MarathonThe brand congratulated runners on surviving the Boston Marathon. Fifty Years Ago, This Woman Defied the Rules and Ran the Boston MarathonBobbi Gibb changed everything in 1966. Dzhokhar Tsarnaev Trial Starts Back Up on TuesdayThe jury will decide whether he will get the death penalty. First Part of Boston Marathon Trial Nearly OverThe prosecution ends their case on Monday. Prosecutors in Boston Marathon Bombing Case Forced to Define ‘Mad Cooked’The jury looks at Dzhokhar Tsarnaev’s tweets. Robel Phillipos: Tsarnaev Friend Guilty of LyingHe’s still awaiting sentencing. Boston Marathon Finish Line Evacuated Due to Suspicious Backpacks [Updated]Police detonated both bags. 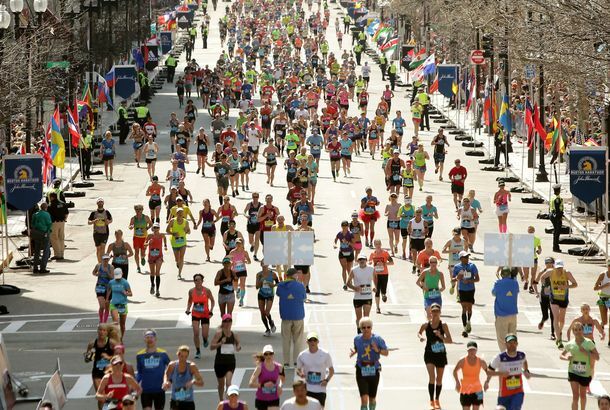 Boston Marathoners Finish Their Race This Weekend In Boston and at the Indy 500 speedway. Unfinished Boston Marathon Runners Invited to Race AgainNext year. Lingering Questions About the Boston Bombers ManhuntFrom the carjacking to the 7-Eleven and more. Internet Raising Millions for Boston Victims, Boat With Bullet HolesThe boat feels less important. Dzhokhar Tsarnaev Charged in Boston BombingThe full federal complaint details the evidence. Tamerlan Tsarnaev: Angry, Militant Murderer?A narrative about the brothers’ personalities is hardening. All the Mistakenly Identified ‘Suspects’ in the Boston Bombing InvestigationThe last was missing college student Sunil Tripathi. Boston Marathon ‘Bag’ Kid Relatively Chill About Implied Bomber AccusationHe spoke, appropriately, to the Daily News. Boston Bombing Suspect May or May Not Have Been Arrested [Updated]There are conflicting reports. On Running, Freedom, and the Boston BombingAn attack on the liberty that the community of runners knows. No Answers Yet in Boston Marathon Bombing Investigation [Updated]There are “a number of active leads,” but nothing definitive. ‘Terror,’ Graphic Images Dominate Newspapers’ Boston Bombing CoversA look at Tuesday’s tragic headlines. Boston Marathon Bombing Leaves Three Dead, More Than 100 InjuredWith no group claiming responsibility. NYPD Stepping Up Security After Boston Explosions [Updated]Just a precaution. Explosions Reported at Boston Marathon Finish Line [Live Updates]Developing. Local Restaurateurs Breathe a Sigh of ReliefMarathons and Red Sox games make people eat out. Happy Marathon Party DayCelebrate the runners with food and drink.